Short Information:- Bihar School Examination Board is Recently Released School Examination Board and Intermediate Exam Date 2019. Applicants with Bihar Board are Waiting for Exam Date can Download Exam Date Now. Bihar Class 10th, 2019 Examination is scheduled from 21/Feb/2019 to 28/Feb/2019 for all subject and Class 12th Examination is scheduled from 06/Feb/2019 to 16/Feb/2019 for all subject respectively. Applicants need to preparing and practicing more and more on their weaker section and topics still there is plenty for their Examination. Applicants can download them Examination Schedule/Time Table from use full important link section provided below. 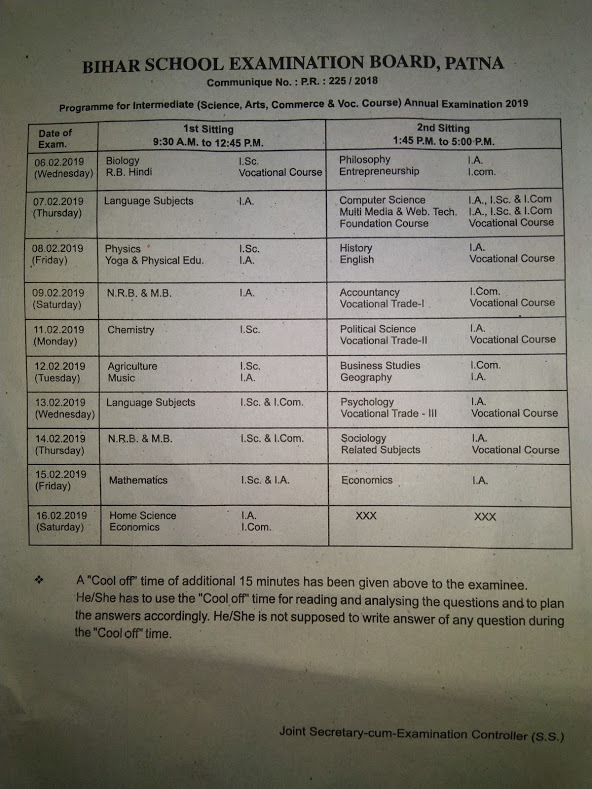 Bihar School Educational Board has recently announced the Examination schedule for Class 10th and 12th Applicants needs to check their respective Classes Exam Schedule. In order to download their BSEB Bihar Board 10th and 12th, Class Exam Date applicants need to go to the use full important links section provided below. Applicants will find their BSEB Bihar Board 10th and 12th Class Exam Date reflecting the time and shift wise details. After getting the link applicant need to click it for downloading their BSEB Bihar Board 10th and 12th Class Exam Date. Applicants can also download their BSEB Bihar Board 10th and 12th Class Exam Date from the official website of the BSEB.